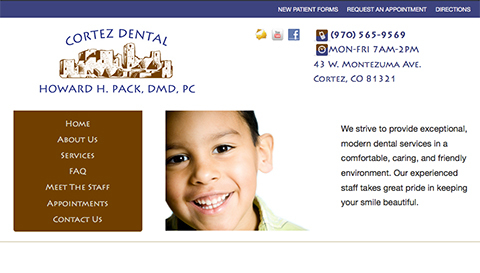 Cortez Dental made the jump from a template website to a fully custom website designed by Cortez Web Services to match their established branding. The new website features an extensive video library to help Dr. Pack and his highly trained staff educate their patients on services and treatment options, which saves time in the dentist’s office. The website also has online forms that allow current and new patients to request appointments, as well as external links that connect to 3rd party software they use to collect personal data like medical history.